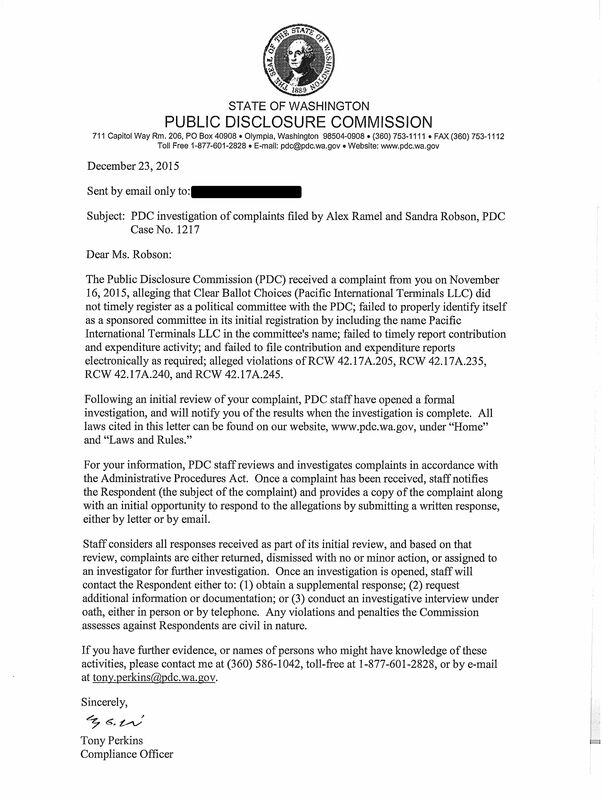 Just sharing the news of the letter I received from the WA state Public Disclosure Committee with the news that they will be conducting a formal investigation of the complaints against Clear Ballot Choices (Pacific International Terminals LLC); one filed by myself on Nov. 16, and one filed on Oct. 30 by Alex Ramel. The letter is shown in the attached photo. Please see the attached letter, notifying you that PDC staff have concluded our initial review of your November 16, 2015 complaint against Clear Ballot Choices (Pacific International Terminals LLC), and will now conduct a formal investigation of the complaint. Please let me know if you have questions. This entry was posted in Commentary, Facebook Post, Information and tagged Clear Ballot Choices (Pacific International Terminals LLC), Coal, Gateway Pacific Terminal, GPT, Kris Halterman, November 2015 Election, Pacific International Terminals, PDC, Proposition 1, Proposition 2, Proposition 3, Proposition 9, Public Disclosure Commission, Ron Reimer, Tea Party, Whatcom County, Whatcom County Charter Amendments. Bookmark the permalink.